You are here: Home › Blog › Pemamo installation – complete ! Pemamo installation – complete ! 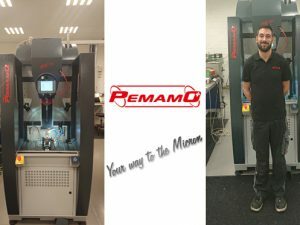 Mathieu, from Pemamo head office in Switzerland, was here in the UK last week to install, set up and test a new Pemamo MVRL160 machine for our customer. Whilst here he carried out some training on the machine too. The MVRL160 is a vertical honing machine for high precision honing and can be supplied with either 1 or 2 spindles. It has a honing range of Ø 1.0 – 70mm, with honing lengths from 0 – 340mm. The machine has many applications in the automotive and aeronautic industries because of its accuracy and honing repeatability, with a final size within 1 µm. The machine can be easily set up using a touchscreen panel and the parts can be manually or automatically clamped.